There are 366 available houses short let in Nigeria. The houses have been listed by estate agents who can be contacted using the contact information provided for each house listing. The list can be filtered by price, furnishing and recency. 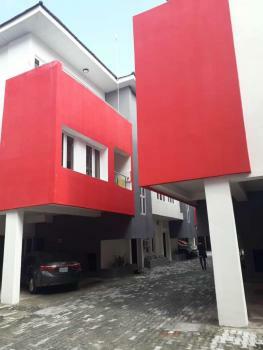 Iroo Suite: Luxury Furnished 3 Bedroom Detached Duplex+BQ, located at Jedmorn Court House 5, No.13 Adebisi Oyenola Street Idado Lekki Lagos. 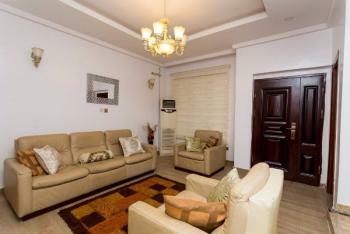 This apartment comes fully furnished and serviced with its luxury design and comfort. It has easy accessibility to any part of Lagos.Facilities: Unlimited high speed internet WiFi 52’inches LG Smart TV DSTV Exploral with premium Subscription. High tech Sound bar&woofer. Air conditional in all the rooms with inverter preinstalled inside. Mini lounge with a 40’inches TV. All rooms en-suite with a 32’inches TV. Chandelier and bright lightings. Water heater installed in all the bathrooms. Jacuzzi in the master bedroom Balcony in 2 of the Rooms. Boys Quarters and gatehouse. Interlocking paves compound with up to 4 parking slots. 24 hours power supply. 24 hours treated water supply system. 50kva standby Generator Wardrobes in all the room and well ventilated. Bath and Shower Dining room with seating for 6 people Kitchen with Fridge, Stove, Microwave Washing Machine, Iron, Ironing Board Guest bathroom Steel Security Door Onsite Security and Gated Secure Compound Onsite Maintenance and Housekeeping Imported Hotel-Quality Towels and Bedding, Bathroom Amenities & Balcony. Etc.Terms and Condition: * Minimum of 3 Nights’ Stay * Maximum of Six(6) Guests allowed inside the apartment. * House parties and get-togethers are not allowed. * Copy of Identity Card and data required upon arrival. * A deposit payment is required to book this apartment for a specific date and duration, subject to ‘first come first serve’ bases.NB: Pickup services and car rental are available. 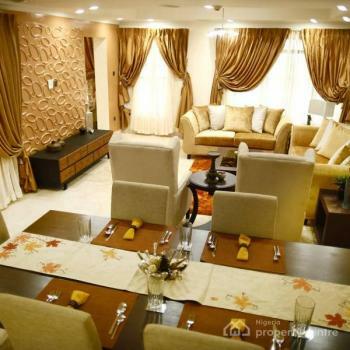 Iroo Suite: Luxury Furnished 4 Bedroom Detached Duplex+BQ, located at Jedmorn Court House 5, No.13 Adebisi Oyenola Street Idado Lekki Lagos. 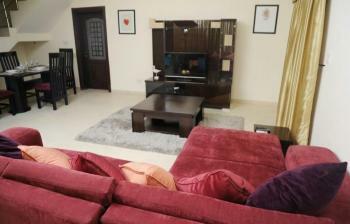 This apartment comes fully furnished and serviced with its luxury design and comfort. It has easy accessibility to any part of Lagos.Facilities: Unlimited high speed internet WiFi 52’inches LG Smart TV DSTV Exploral with premium Subscription. High tech Sound bar&woofer. Air conditional in all the rooms with inverter preinstalled inside. Mini lounge with a 40’inches TV. All rooms en-suite with a 32’inches TV. Chandelier and bright lightings. Water heater installed in all the bathrooms. Jacuzzi in the master bedroom Balcony in 2 of the Rooms. Boys Quarters and gatehouse. Interlocking paves compound with up to 4 parking slots. 24 hours power supply. 24 hours treated water supply system. 50kva standby Generator Wardrobes in all the room and well ventilated. Bath and Shower Dining room with seating for 6 people Kitchen with Fridge, Stove, Microwave Washing Machine, Iron, Ironing Board Guest bathroom Steel Security Door Onsite Security and Gated Secure Compound Onsite Maintenance and Housekeeping Imported Hotel-Quality Towels and Bedding, Bathroom Amenities & Balcony. Etc.Terms and Condition: * Minimum of 3 Nights’ Stay * Maximum of Eight(8) Guests allowed inside the apartment. * House parties and get-togethers are not allowed. * Copy of Identity Card and data required upon arrival. * A deposit payment is required to book this apartment for a specific date and duration, subject to ‘first come first serve’ bases.NB: Pickup services and car rental are available. 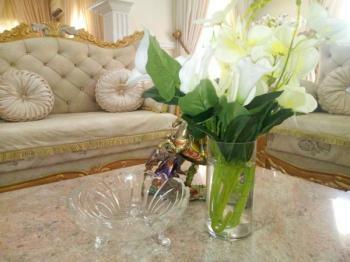 Our exquisitely finished home with modern furnishing and decor. Its a home with private entrance. All bedrooms have king sized beds and soft pillows and duvet, also each with its own private toilet/bathroom. 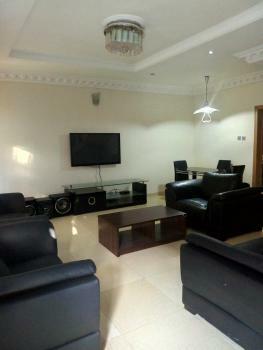 In our home, you have privacy as you have the whole house to your self.Its located in Maitama. Its close to everything - the Hilton, the British High commission and other embassies, shopping malls, night life, farmers market, all less than 2 - 5 mins drive. Area is good for morning walks.At our home, you have the full experience of home away from home, as we have thought of the needs of our guests.Our Sitting room has : - 55" Curved flat screen TV with DSTV explorer, Netflix, Youtube TV, Hulu etc - Beautiful Royal chairs - Dining table with chairs - Beautiful DecorOur Kitchen is fitted with: - Airconditioning - Refrigerator - 6 points cooker with oven - Microwave oven - Blender -Coffee maker, - toaster - Cookware, glassware, mugs, etcAll bedrooms have: - Airconditioning - 32" TV with DSTV connection - King sized beds - Soft pillows and duvets - Reading table and chair - Wardrobes - Rugs - Bedside lamps and drawers EtcAll bathrooms have: Water heater Clean fresh towels Toilet paper Shampoo Toothbrush etcAlso available is washing machine , WIFI, CCTV cameras outside.We have a house keeper on the premises who attends to the every need of our guests. We have also uniformed security on the premises. Also available on request is a chef for both Continental and African dishes.Our home is close to everything you can think of.A place you will never forget in a long time. 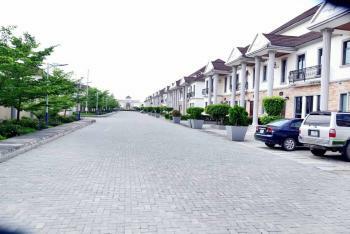 The estate boasts of facilities such as: 24-hour power and water supply, security, street lights, a reserved commercial area, recreational center, beautifully landscaped environment with green areas everywhere, as well as good maintenance.There are adequate security measures put in place in the estate, as guards are positioned at the gate and at various strategic locations within the estate. There are also armed mobile policemen in the estate.Entry into Emperor Estate by non-residents is restricted. Visitors are required to call their hosts; otherwise, they would be denied access into the estate. 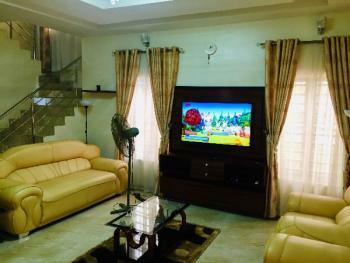 This fully serviced brand new house is also fully furnished with top notch quality fittings. 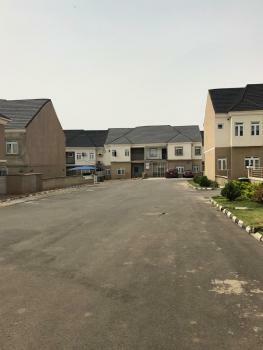 This property comes with a gym, swimming pool etc, Just come in with your cloths and live like a king that you are for seventy thousand naira only (70,000.00) a day. Why check into a hotel when you can get this all in one. Kindly call us now. At our home, you have the full experience of home away from home, as we have thought of the needs of our guests.Our Sitting room has : - 55" Curved flat screen TV with DSTV explorer, Netflix, Youtube TV, Hulu etc - Beautiful Royal chairs - Dining table with chairs - Beautiful DecorOur Kitchen is fitted with: - Airconditioning - Refrigerator - 6 points cooker with oven - Microwave oven - Blender -Coffee maker, - toaster - Cookware, glassware, mugs, etcAll bedrooms have: - Airconditioning - 32" TV with DSTV connection - King sized beds - Soft pillows and duvets - Reading table and chair - Wardrobes - Rugs - Bedside lamps and drawers EtcAll bathrooms have: Water heater Clean fresh towels Toilet paper Shampoo Toothbrush etcAlso available is washing machine , WIFI, CCTV cameras outside.We have a house keeper on the premises who attends to the every need of our guests. We have also uniformed security on the premises. Also available on request is a chef for both Continental and African dishes.Our home is close to everything you can think of.A place you will never forget in a long time. Full furnished well maintained self serviced 4 bedroom terrace for short let Price - N350,000 per month Agency Fee - 10%Direct Brief. 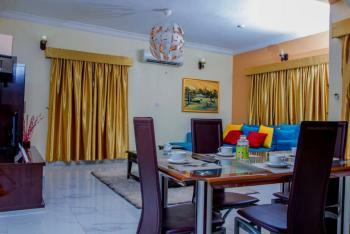 The Gravitas is an epicurean, tastefully furnished 3 bedroom apartment. It is located in an idyllic estate known for its serenity and safety. The apartment is a duplex making it perfect for those who value their privacy. 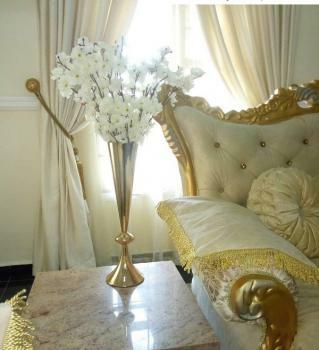 Many of the accessories and fittings are imported from Europe making the apartment amply comfortable for our discerning guests who are mostly from abroad on holiday or business trip.The apartment being in an estate close to the Lekki Epe Expressway makes the apartment easily accessible, and without any of the motorway noise. The estate is guarded by mobile police (MOPOL) and ably supported by a private security outfit. 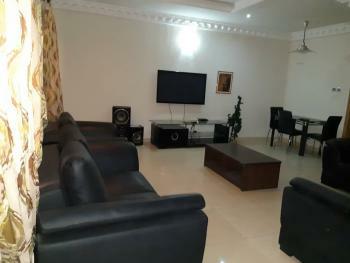 This apartment is perfect for a family or a group of friends who are visiting Lagos and would like to stay in a true home environment and for a great sharing experience. 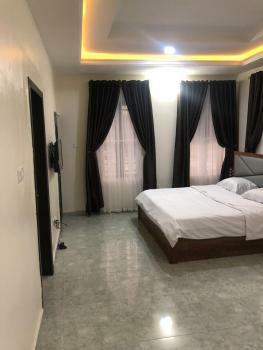 The apartment is also for those who get a satisfaction from getting value for their money, particularly when compared with the cost of renting single hotel rooms in that part of Lagos.All the bedrooms are en-suite with the shower areas enclosed in glass. The shower taps are the high quality thermostatic (temperature does not fluctuate) type and are imported for our guests’ comfort.The sponsors of this apartment having lived abroad embarked on this project with the singular aim of providing complete comfort for guests visiting from anywhere in the world.The amenities provided for guests’ comfort in this apartment include:· 24/7 power supply - made possible by a combination of publicly supplied power (EKEDC), a new 20 KvA generator set (UK Perkins engine), and an inverter power system· A modern and beautifully fitted kitchen with all the necessary appliances that our classy guests need – such as a gas & electric cooker, a microwave oven, a Thermocool fridge/freezer, a big-load washing machine, a noise-free blender, a toaster and so on. The kitchen is also stocked with all the utensils fit for a palace, including various types plates and bowls, drinking glasses, cutleries, hotplate gloves etc.· A big flat screen TV in all the rooms· Uninterrupted DSTV connection in all the rooms· A dinning set/area· Brand new powerful Panasonic AC’s for guests’ comfort· Curtains that cut-out daylight when pulled for guests’ good night sleep· Free Internet (WI-FI) connectivity· A dressing/work table for laying out things or for working – laptop etc.· Queen-size 7’ X 7’ beds in all 3 bedrooms, with the thickest comfortable mattresses to match· Regularly replaced, clean, and bright white bed linens· Twice-a-week housekeeping that keeps the apartment in top notch from top to bottom· Smoke alarm· Fire extinguisher· Car park spaces for at least 4 cars.